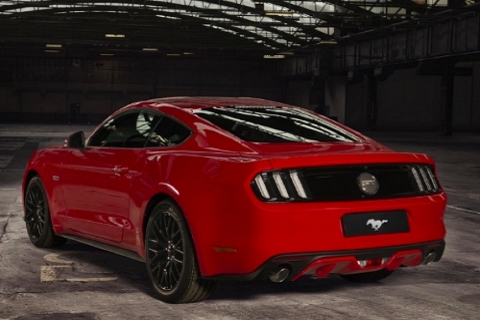 Ford finally unveiled its iconic Mustang all-American muscle car in India. 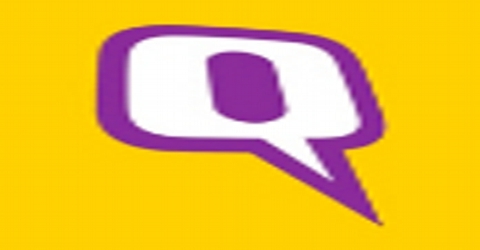 The company held a pre-Auto Expo show in New Delhi where it announced that the car would go on sale in the subcontinent in the 2nd quarter of 2016. Fulfilling the dream of many Indian automotive enthusiasts, Ford Mustang GT will arrive in a right hand drive. What are the features of the Indian version of Ford Mustang? The new model is powered by a 5.0-litre V8 engine that is capable of producing 435bhp of power along with a peak torque of 524Nm. Power will be transmitted to rear wheels via a six-speed Select Shift automatic gearbox. It also gets steering-mounted paddle shifters, and is claiming to achieve 0-100 kmph in just 4.5 seconds and 25.01 km/lit mileage. The Mustang features Brembo brakes with 6-piston front callipers, ESP, Electronic Line-Lock and an independent suspension set-up at the rear (this feature is being offered for the first time in Mustang). 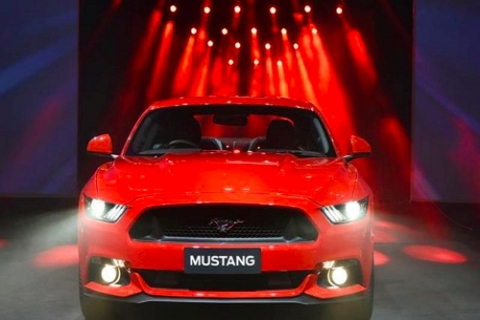 The right-hand-drive Ford Mustang arrives into the Indian car market as CBU (Completely Built-Up Unit) unit. It gets all the features that are offered on the international spec model. The Ford Mustang is equipped with a 4.2-inch multi-information display on its instrument cluster. A 390 Watt Shaker Pro Audio system will be made available as an optional feature. Why were there no Ford Mustangs in India so far? Ford Mustang originally is a left hand drive vehicle which didn’t suit Indian roads as most cars here are right hand drives. The Mustang costs $33,000 in the USA. That means almost 19 lakhs in Rupees. Then the 125% import duty takes this number to almost 42 lakhs which is the price of the basic model. Registration and insurance could take the price to almost 50 lakhs. Parts and servicing would be very expensive as the car needs Synthetic Oil and parts would have to be imported. The Mustang is large and broad which makes it unsuitable for our congested urban environments. The Mustang has never been on Indian roads and has never proven its reliability. When the Journey of Ford Mustang began? The first Mustang was rolled out in 1964, and the company was ambitious about this car. They expected to sell 100,000 of these in the next 12 months – they achieved that milestone in 3 months! The Mustang then had technologies like power steering, power brakes, bucket seats, long bonnet, low roofline and a short boot on the back. To top it all off was a huge, loud engine that pulled this car away like a rocket. If you were driving one of the earlier versions of the car, you’d have to start braking 10 km before the bend in the road showed up. Almost synonymous with the term ‘muscle car’, it laid the foundation for numerous cars and gave rise to competitors such as the Chevrolet Camaro, Pontiac Firebird, AMC Javelin, Chrysler's revamped Plymouth Barracuda, and the first generation Dodge Challenger. Where else will Ford Mustang be launched and why? 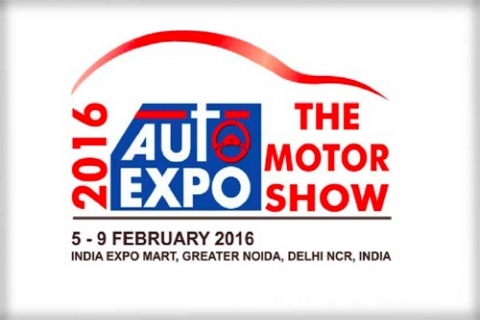 It will be launched at the 13th Delhi Auto Expo. Once in every 2 years, Delhi glows on the world motoring map as major automakers, connoisseurs, enthusiasts and buyers gather in the Capital to see their dream cars turn into reality. The auto expo provides a major boost to the Indian economy, which is set to become the third-largest market for vehicles by this year. Although not as technologically advanced as the Tokyo, Geneva or the Detroit motor shows, the Delhi Auto Expo is known to focus on transportation options for the common man in major markets. While everyone looks forward to the exclusive super cars and dream rides showcased at the event, most launches are intended for mass production – witnessing great success across global markets, including India. 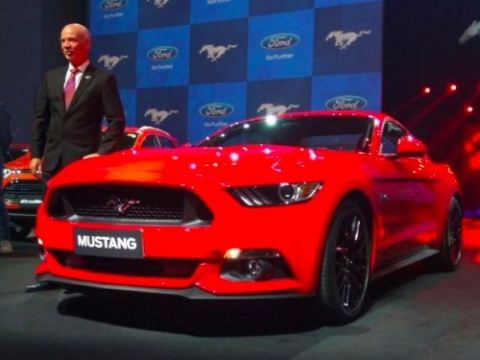 Who are the competitors for Ford Mustang in India? Although the Mustang’s U.S. rival, the Chevrolet Camaro isn’t yet sold in India by General Motors Co., the Ford car is expected to compete for attention with buyers of luxury car brands such as Porsche AG, Mercedes-Benz, Audi AG, BMW AG and Jaguar. Audi India sold 11,192 units in 2015 as compared to 10,851 units in 2014. The German automaker also had 10 product launches in India last year. Mercedes-Benz India sold 13,502 vehicles in 2015, with 32% year-on-year growth, which is their best performance ever. 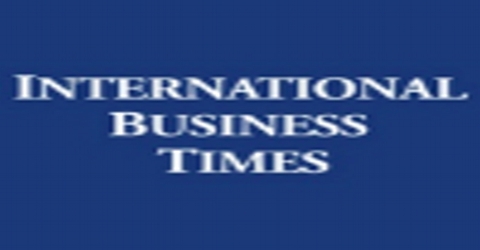 The strategy of 15 new product launches in 2015, christened "15 in 15" really worked for Mercedes-Benz India, helping it reach on top spot after being runner-up in 2013 and 2014. Despite slipping to 2nd place, Audi India marked the 8th successive year of registering nearly 3% growth compared to 2014. The 10 launches in 2015 included the limited-edition R8 LMX, new TT Coupe, S5 Sportback and the new Q7. How has the Indian luxury car market performing in India? India is one of the world’s fastest growing market for ‘passenger vehicles’ and firmly focused on the top spot. According to a 2014 report by Economic Times, this growth is fuelled by the luxury car market, which has grown from 4,000 units in 2007 to 33,000 units in 2014 and is projected to reach 150,000 units by 2020. The luxury car market in India has grown much faster than the mass-market segment and the trend is expected to continue as young, educated Indians enter this market with high levels of disposable income. The average age of a luxury car owner in India is 35 compared to a global average of 43-45 years. 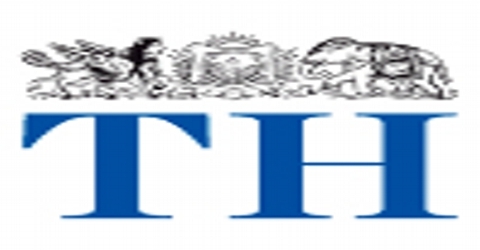 India’s population of High Net worth (HNW) individuals is expected to grow from 200,000 in 2012 to 1.5 million by 2020. 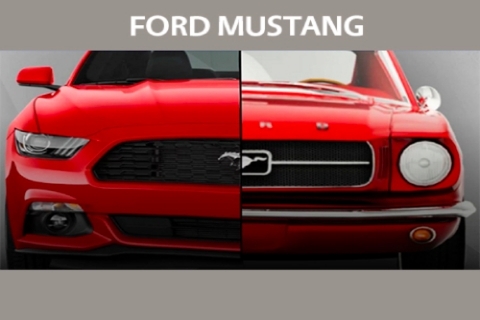 The Story of the Iconic Ford Mustang: A Journey of Over 50 Years. 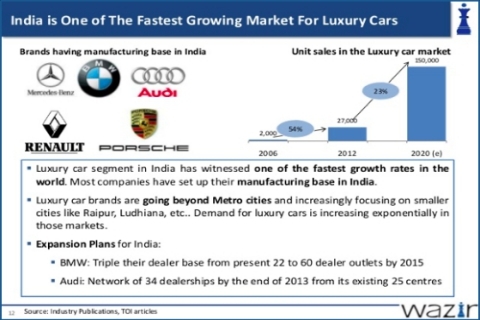 The rapid expansion of the luxury car market in India. Audi India loses top slot to Mercedes-Benz in luxury carsales in 2015.